From Hokusai's "The Great Wave Off Kanagawa" to the Meiji Shrine, from bonsai and Zen gardens, Japan's centuries-long legacy of distinctive art and architecture is a gift to the world. This captivating journey takes you deep into the country's ancient past and compelling present, telling the tale of a great nation through its beautiful, touching art, architecture, and horticulture. We begin our tale on just the right note with a welcoming tea ceremony in Tokyo, followed by a privately guided tour of the Japanese capital's traditional landmarks, most notably the Meiji Shrine, the stylish Omotesando high street, and the observatory atop the Tokyo Metropolitan Government Building, one of the city's tallest and most distinctive skyscrapers. Later in the Omiya ward of nearby Saitama, you'll visit the Bonsai Museum to learn more about the delicate botanical art before taking a private tour of Tokyo's National Museum of Modern Art, home to a stunning array of contemporary paintings, sculptures, and photographs. Next, journey to Kanazawa for a private and hands-on demonstration of the city's famous traditional crafts, then devote a full day to exploring this charming city's traditional homes, the geisha and samurai districts, and teahouses with a private guide. Peaceful Kyoto is your next stop. 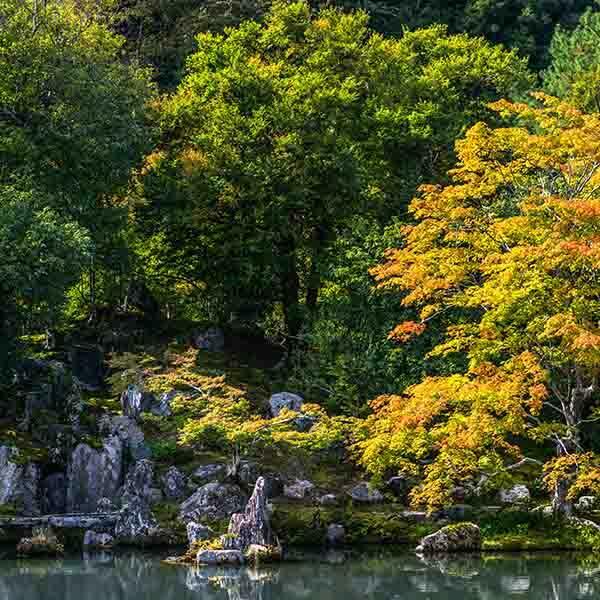 Here, take a private tour of the scenic Arashiyama district and its bamboo groves, UNESCO-protected shrines, and landscaped gardens, pausing along the way to savor a cup of green tea. Tour some of the city's most impressive gardens in private and try your hand at traditional Japanese crafts under the tutelage of local experts before heading to Naoshima on the shores of the Inland Sea. Known for its fascinating art scene centered around Benesse House, Naoshima boasts a relaxed, almost Mediterranean atmosphere. Last stop: Osaka, where a private guide will take you to Himeji Castle, a UNESCO World Heritage site that has withstood earthquakes, fires, and wars; a fitting metaphor for how Japan's art and culture have endured through the centuries. Kensington Tours creates private trips from the world's finest ingredients. Tailor-made with care by your personal Destination Expert, your personalized trip is always a one-of-a-kind experience made just for you. Expert local guidance and 24/7 service come standard. Experienced local guides, finely attuned to your personal expectations and connected to the people and culture, deliver breathtaking moments. This is the simple truth that guides Kensington Tours. The best spot to find the black rhino, a secret café and a favorite local dish, a personal account from a defining cultural moment and a local tradition shared - these are the experiences that endure. Kensington Tours is the inspiration of intrepid explorer and Royal Geographic Society Fellow Jeff Willner. His thirst for travel stems from growing up in Africa where his parents worked for most of his childhood, and where he discovered the richness of global cultures. A veteran of global expeditions to over 70 countries, he has criss-crossed the continents to experience the extraordinary. During these years, Jeff realized the vast difference between a package tour and personal discovery - where deep knowledge and personal attention of a local guide can turn a trip into an experience.